They stand like sentinels on the Kent coast, overlooking the sea that they made safer for seafarers. Now, apart from still remaining in place, there is no outward indication that the lighthouses at South Foreland and North Foreland were involved in a momentous event that became part of maritime history. On 24 December, 1898, Guglielmo Marconi, the Italian pioneer of wireless telegraphy, successfully established over-the-sea communication between the South Foreland lighthouse and the East Goodwin lightship, anchored on the eastern side of the Goodwin Sands. They were some 12 miles apart. Furthermore, this was also the first occasion when wireless was introduced into use in a British lighthouse. and also as a means of communicating between ships and the shore and vice versa. The ‘wireless apparatus’ had been taken to the lightship in an open boat, set up in a single afternoon and was ready to be used ‘without meeting the slightest difficulty or delay’. And so, on that Christmas Eve, the experiment with the apparatus was deemed successful enough to be brought into regular operation. ‘Marconi has placed a lightship on the Goodwin Sands in instant communication day and night with the South Foreland lighthouse. A touch of a key aboard the lightship suffices to ring an electric bell in a room at South Foreland lighthouse 12 miles away, with the same ease and certainty with which one can summon the servant to one’s hotel room. ‘An attendant now sleeps hard by the instrument at South Foreland. If at any moment he is awakened by the electric bell rung from the lightship he is able to ring up in turn Ramsgate lifeboat and, if need be, direct it to the spot where its services are required within a few seconds of the call for help. This was one of two early occasions when the lightship itself benefited from having wireless telegraphy. On the other occasion, in a fierce storm, part of the lightship’s bulwarks were carried away and assistance similarly summoned. Even as these experiments were taking place, Marconi had in mind a more ambitious role for wireless telegraphy linked to South Foreland lighthouse. In September, 1898, his Wireless Telegraph & Signal Company had asked for permission from the French government to construct a wireless station on the French side of the English Channel. This request did not receive official approval until 2 March, 1899, but when it was granted, the company carried out a survey of the Boulogne area and a suitable site was chosen at Wimereux, three miles north of Boulogne. The station was built by 26 March, 1899, ready to attempt to communicate with South Foreland 28 miles away. On 27 March, in front of a French government commission of army, navy and telegraph service representatives, Marconi achieved the first international wireless message between Britain and Europe, as it crossed the Channel from the Wimereux station’s mast to South Foreland lighthouse. The witnessing representatives set test messages to be sent to various prominent people in England – these were received successfully and forwarded to their respective recipients by overland telegraph. The witnesses were impressed. A special correspondent from The Times was also present and, the next day, South Foreland lighthouse received the first international press message by wireless telegraph, simultaneously achieving the first inaccuracy in an international press message when he stated that the distance between the two points was 32 miles instead of 28 miles. It could be assumed from this successful establishment of contact by wireless telegraphy over such a distance that its commercial potential was assured. But there was a problem. Communication between two stations was satisfactory, but if a third wireless station within range began to transmit at the same time, the radiations spread out over a number of frequencies and the transmissions jammed each other. In an attempt to solve the problem, one proposal was to ‘ration’ the transmission time of every station, so that each had exclusive use of the system for a stated period, then cease transmitting to allow others to do so. The second, more practical proposal, was to undertake research to reduce the spread of the radiation. This had to be the way forward if, as Marconi envisaged, there was to be a multiplication of stations as the use of wireless telegraphy increased. Thus the second proposal was taken up, with the three stations at East Goodwin, South Foreland and Wimereux involved in the tests. By 11 April, there had been sufficient progress so that South Foreland was able to communicate with East Goodwin without a single dot being received by Wimereux. After this, more demonstrations were witnessed by representatives from the French government, which had placed at Marconi’s use its warship Ibis and storeship Vienne. The Vienne, with Marconi and the representatives on board, steamed about in the English Channel making a series of test communications with South Foreland on 17 June, 1899. These also proved to all present that there had been an improvement in selectivity. ‘During the last few days I have been permitted to make a close examination of the apparatus and methods employed by Signor Marconi in his remarkable telegraphic experiments between South Foreland and Boulogne, and at the South Foreland lighthouse have been allowed by the inventor to make experiments and transmit messages from the station there established, both to France and to the lightship on the Goodwin Sands, which is equipped for sending and receiving either wave signals. The Marconi Company used the South Foreland lighthouse again in September, 1925, for an experimental transmission of a radio guidance system in which an aerial, like the three wings of a triplane, revolved every two minutes sending coded signals. Marconi’s yacht, Elettra, had cruised the Goodwins area for several hours while British government and shipping officials aboard saw the system give all the ships within 100 miles an index letter that would indicate Electra’s position, particularly useful in poor visibility. In addition to Marconi’s experimental work with South Foreland lighthouse and the East Goodwin lightship, it is little known that he also established an experimental station in 1909 just outside the boundary wall to the north of North Foreland lighthouse. He had previously established an experimental station in the near vicinity, at Northdown, Kingsgate, but shut it and moved some of the buildings to North Foreland. A three-step mast was constructed, followed by two more masts and a radio station. Later, a purpose-built coastal radio station was developed in Fairfield, Broadstairs, and the radio station apparatus was transferred there, becoming known to seafarers as North Foreland Radio. Another later development was a latticework mast built near the former site of Marconi’s mast and from this, a wireless fog signal developed the Radio Beacon Service. In October, 1998, North Foreland lighthouse was the last lighthouse in England to become automated. 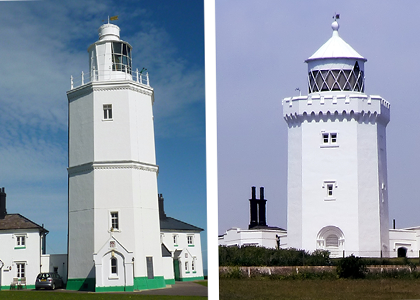 South Foreland lighthouse was made redundant by Trinity House on 30 September, 1988. It was bought by the National Trust in 1989 and is now a listed building. See for yourself where all this happened and learn more about Marconi’s pioneering scientific experiments: South Foreland lighthouse is open to the public from 11 March to the end of October. There is no parking on site – park at the NT car park at The White Cliffs of Dover, then walk along the cliff tops (about two miles) or at St Margaret’s village/bay (one mile).